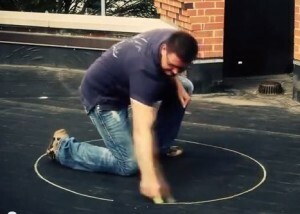 Chalk prayer circles have caught on in the Christian world, just as many other new techniques and methods for experiencing God have caught on. 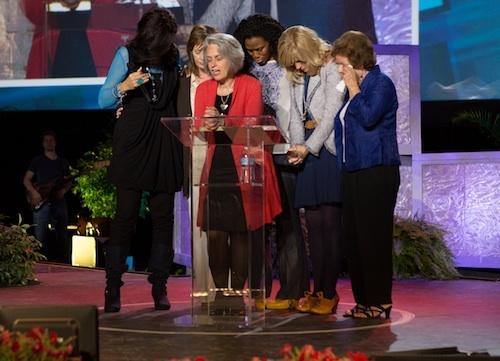 At the September 2012 Indianapolis True Woman Conference headed up by titans in the female evangelical world, Nancy Leigh DeMoss and Joni Eareckson Tada, those and other well-known conference speakers repeatedly urged women to pray inside a drawn or made circle, and they did so themselves. Holly Elliff: I loved that during the conference around the auditorium and in various places there were circles. Joni Eareckson Tada: Because all the speakers had an opportunity to stand in it. And of course, I had an opportunity to wheel inside that circle. May revival begin with me. 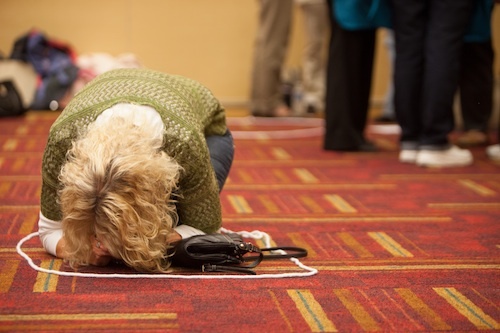 True Woman simulcast participant Jamie McMullen’s concern led her to research this circle making and praying, and also to contact the conference organizers to ask if they were aware of the deep occult and pagan origins of this circle making. She wrote, “I received an email back promptly assuring me these circles are to help us visualize our commitment to God as well as give an outward showing to God that we are repentant and want revival to start with us. Then the representative stated: “No occult connections”. However they are severely deluded as to the occult connections. The pagan connections is the point of this essay. Sola Sisters, Jamie McMullen, and Pastor Swofford did a superb job of showing why chalk circles are not biblically supported, using Bible verses, and I urge you to read their essays to see why. All the links are in one place down below. Therefore, I am taking this issue from the occult angle. Interestingly, after three hours’ research last night I came across Pastor Jason Swofford’s work which exactly confirmed my own research as far as why and how the practice varied from the Bible, and for that I’m grateful. He is pastor of the Myers Road Baptist Church in WA and his research on prayer/chalk circles can be read here. He has two essays and a video. The Gnostic always ties in what you do with your spiritual success. “If you do this…God will do this…”. That is one way to tell if you are being fed a Gnostic technique. Secondly, run fast and far from anyone who says they have come up with “a new way” to do anything regarding Christianity. God delivered His word once for all to the saints. (Jude 1:3). Moreover, Jesus was very specific when He taught us how to pray. (Matthew 6:5-15.) In Matthew 6:9 Jesus said “Pray, then, in this way”. It is not possible to get any clearer about how to pray. For Batterson to declare he is teaching us a new way directly goes against what Jesus said in the canonized and complete revelation we know as the Bible. 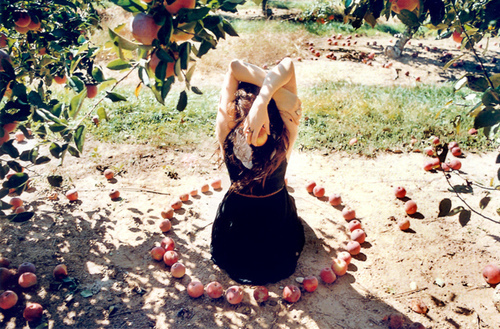 I believe in the power of photos so I gathered photographs from different eras and different cultures and different religions which depict people praying inside a sacred circle. Looking at the pictures it is clear that chalk circle praying is pagan. This is not a “new” thing, despite Batterson’s advertising it as such. 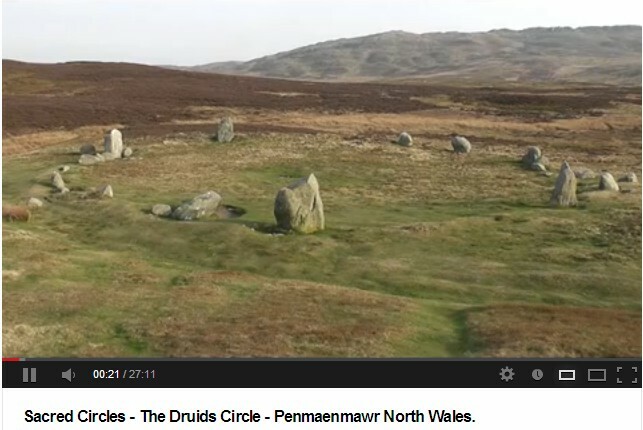 As a matter of fact, ritual circle making is as old as the hills, and has always been unbiblical. 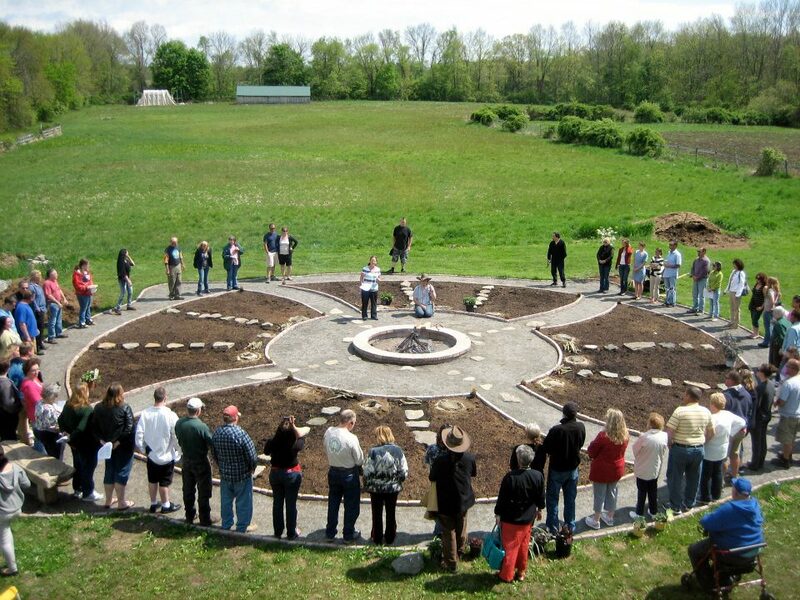 I ask you, is Batterson’s making a chalk circle above any different from the Wiccan making a prayer circle below? Both are making a space they claim is sacred, as opposed to the space inches away outside the circle that is common. This sacred space keeps evil away, they both claim. Both claim that it is a bubble that has power and will draw down promises from on high to the benefit of the petitioner. 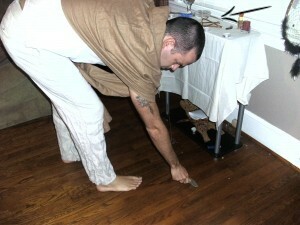 The man below is a Wiccan, showing how to “cast a prayer circle”. You can see he is a Wiccan, I placed an arrow atop his shrine that points to his pentacle. In Wiccan circle casting we are told that we cast a circle “to direct your energy (read – make your thoughts materialize –) …and to create a concentrated flow of energy and direct it into the informational system of the Universe. In other words, casting a circle ensures you achieve the result faster and do it safer.” This description matches Batterson’s concept completely. 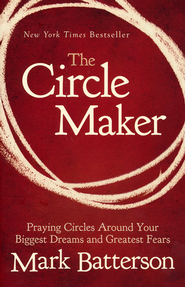 In Batterson’s The Circle Maker, he promises that if read his book, “we will claim God-given promises.” He also states that “if you draw prayer circles, God will answer those prayers.” Both the Wiccan and Batterson say the same thing- draw a circle, pray to a higher power, and get results. That explanation is no different from Revive Our Hearts’ email response noted above, that we should stand inside a circle, visualize, and call on the Spirit for what we want. No. Different. The photos below are explained thus: In Hinduism, Human beings with their finite instruments of knowledge, cannot conceive of the formless Infinite. So the use of images aids concentration. 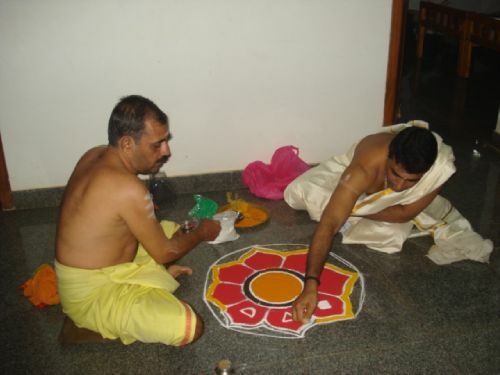 Last month, we had performed a ‘Graha shanthi homa’ in our home. 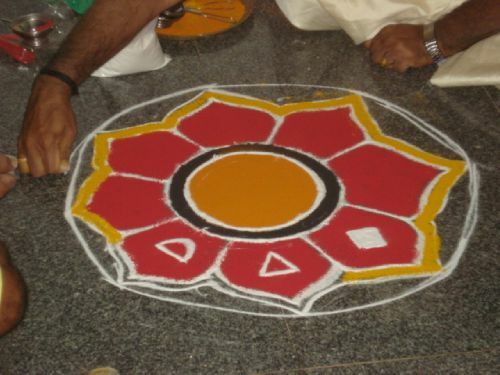 As part of the prayers to the Sun God, a beautiful mandala was drawn on the floor in front of the puja room. Native Americans pray inside a medicine wheel. 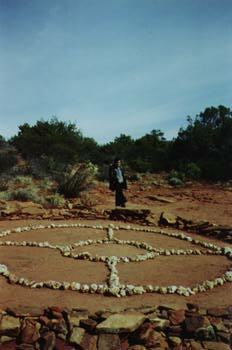 The most potent objection to sacred circles in my opinion is their origin from Wicca. In Witchcraft we learn how to cast a circle, something in the photo way above I’d posted. 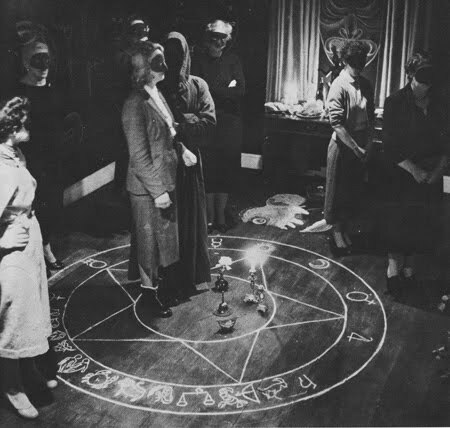 Below, a Witch coven in the 1940s. 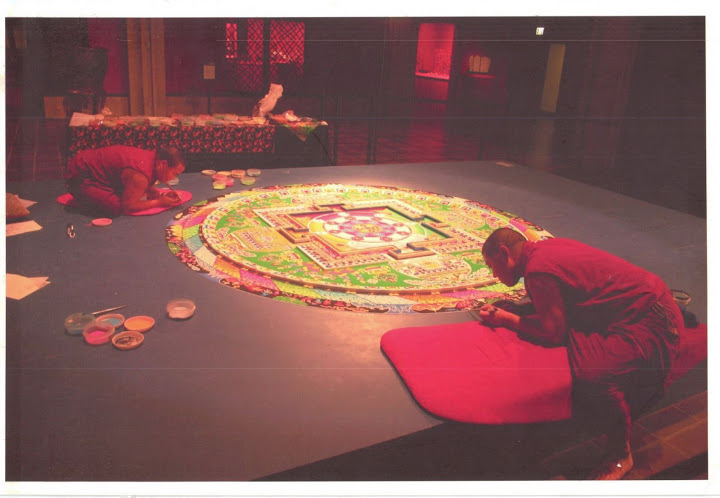 Prayer labyrinths are also similar to chalk circles. 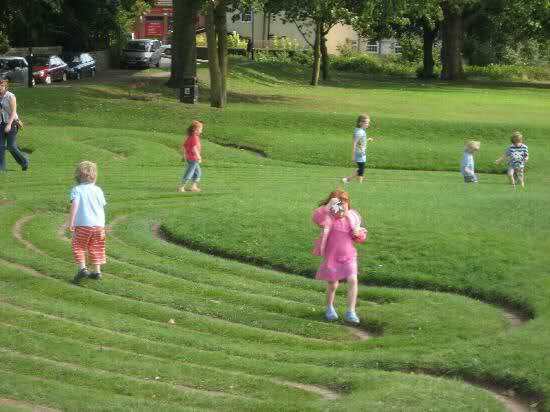 Above, people walk the Saffron Walden turf labyrinth in Essex England. 1. Whenever someone says they have a NEW way of doing Christianity, run. This includes a new way to fast, a new way to pray, a new way to experience God, a new way to do church … I say run, because Jesus outlined what to do via the Spirit in the Bible. It is all there before us. There are no new ways. There is only THE way. 2. Whenever someone discounts the Bible implicitly or explicitly, run. Mr Batterson had said, “You can’t just read the Bible. You need to start circling the promises.” He has added a work, and this implicitly says the Bible isn’t enough. 3. Ritual/Idol/Activity – Whenever someone says you have to perform some activity to get God’s notice, run. 4. Gnosticism always implies the author has either a secret knowledge or a hierarchy to get closer to God and is revealing it for the first time now. Batterson said if you perform circle casting, the following will occur- “the CLOSER you get to God the BIGGER your dreams get.” I don’t know how much closer we can get to God than having Him INSIDE us. 5. Beware of people who use personal examples and not the Bible to “prove” their new method works. The bad news…”The Circle Maker for Kids” is being released on August 6. 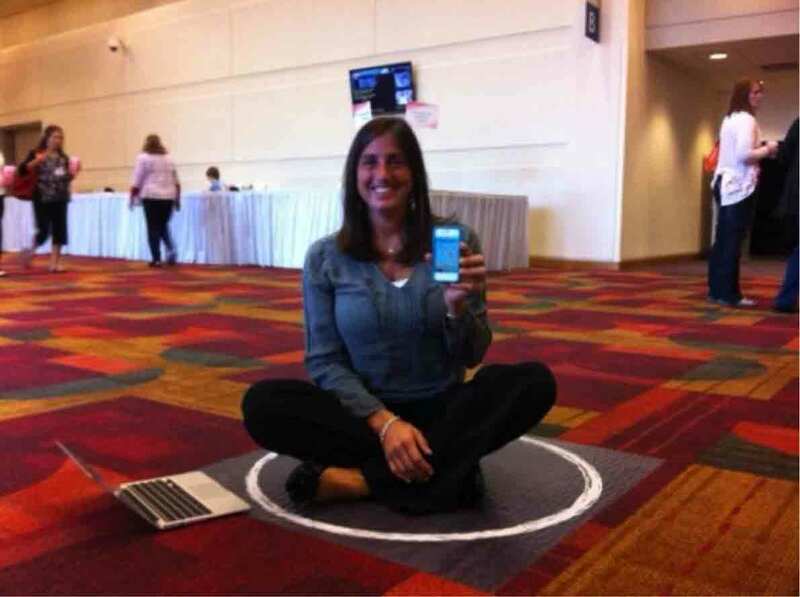 I hope you can see by now that despite Batterson’s claim that this circle praying isn’t a ritual, it is. I hope you can see by now that despite the True Woman conference people saying it has no link to the occult, they are wrong. I hope you have read enough to see that if the book or Bible study is presented at your church, you can refuse on solid grounds. It never originated from the Bible, and therefore is not profitable for us. Here are more links to read thoughtful and biblical explanations as to why, when it comes to praying inside a circle, you should leave the practice alone and stick to Matthew 6.